On the occasion of the 60th anniversary of Albania's membership in UNESCO is opened in the Miro hall, UNESCO, the exhibition "Window in the Albanian Medieval Art", with the participation of Ernesto Renato Ottone Ramirez, Deputy General Director for Culture at UNESCO, Minister of Culture of Albania Mirela Kumbaro, Deputy Minister of MPJE, Artemis Dralo, Ambassador of Albania in UNESCO, Ferit Hoxha and personalities and ambassadors at UNESCO. "What can we do to promote peace in the world? This is the issue that UNESCO has set for solutions since it was created in 1945, just after the wars that bloomed the world. An answer to this has been given by our Albanian Signor Mother Teresa: Go home and love your family! "Said Minister Kumbaro in her opening word. 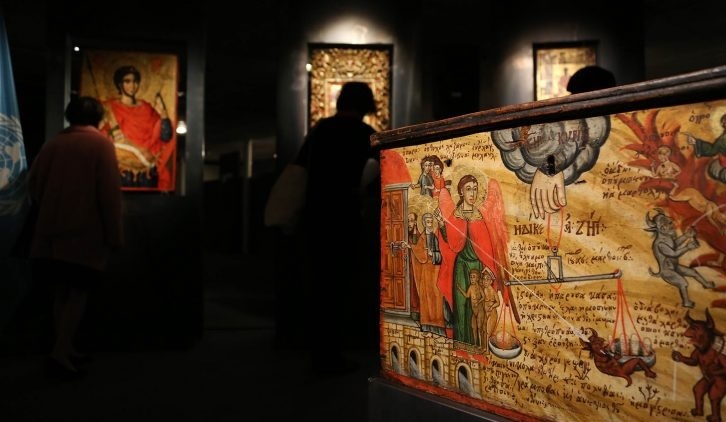 This exhibition in Paris, in the Miro hall, is a journey in the history of Byzantine and post-Byzantine painting in the Albanian territory and invites the general public and scholars to a rare experience in the knowledge of eponymous and anonymous masters as well as ateliers on of the time through the work inherited from them. "When Albania entered UNESCO 60 years ago, we had not solved yet the problem of peace with ourselves, and for more than 30 years our presence was almost formal, simply with the desire to be in false peace with others. Everything starts with the recognition of yourself and the other. This is the essence. And the knowledge starts from customs, traditions, lifestyles, expressed in the architecture of houses, historic centers or rare facilities, that is, the material and spiritual heritage that everyone carries, so starts with Culture." said in her speech Kumbaro . That is why the first significant step with UNESCO came in 1992 with the acceptance of Butrint in protected world heritage sites. For the first time, our wealth gained the merit of becoming part of the world heritage mosaic. How to vindicate the notion that civilization can not be built with closed castles, but with an open amphitheater. This cannot be understood without exchanges, influences, relationships, and stratification of cultures. 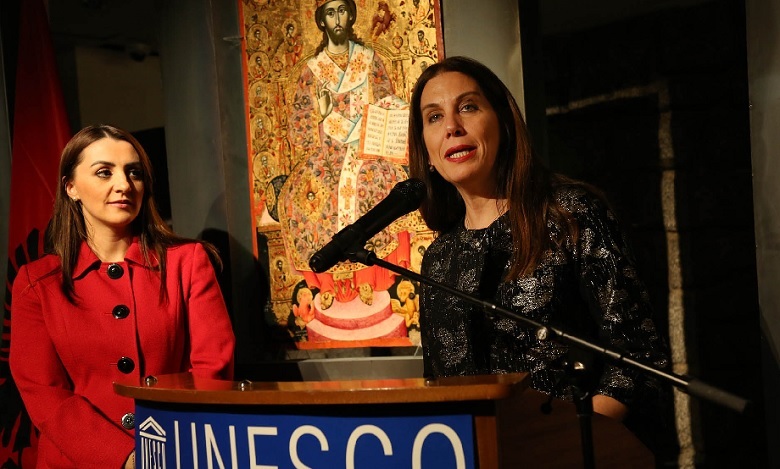 "UNESCO remains irreplaceable in this unique role of importance that gives education, culture, values of civilizations that constitute the guarantee of the stability of our countries, which will be saved by Culture. Albania becomes a participant in the creation of common values of European civilization, which we have the structure and which we want to develop together, because the past that we keep together will be the foundation of our future." added Kumbaro in her word. Beyond the visual interest and the artistic intent that consists in illustrating eclectic painting phases, the main axis in the selection of icons is the presentation of aspects of the daily reality of the society of the time, ideas and concerns permeating human relationships, or other dimensions - part of material life - such as civilization, dressing, converting them into direct concepts to be understood by the visitor. In a broader perspective, the exhibition contributes to the influence of Byzantine Civilization in other peoples of the Mediterranean world, witnessing the continuity of this cultural and aesthetic tradition in religious painting even after the fall of Constantinople in 1453 and the deployment of the Ottoman Turks in the Balkans. 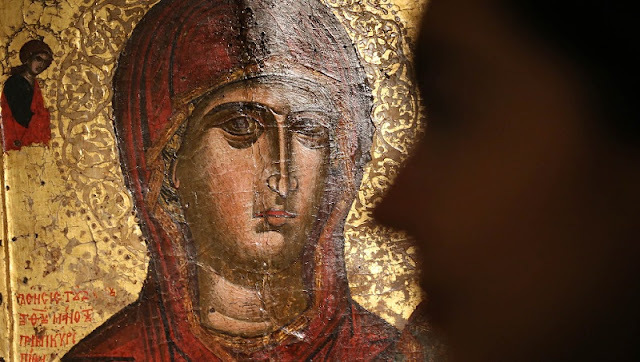 "Such is this exhibition that we open here today in UNESCO, a small gesture of our wonderful culture, Our Art History, a handful of our Byzantine art, which we have exposed in a new and wonderful museum medieval art in Korça, a beautiful city in Albania, with a perfect balance between the East and West, as is Albania itself, where spiritual life is human love, as in the most successful works of art."